There are only a few days left to sign up for Soapbox Science 2015, which is happening in 7 cities across the UK this year. We’re looking for women in science from PhD students to Professors, and from entry-level researchers to entrepreneurs, who are passionate about science and want to spread the word. Applying to join an event is easy to do. There’s a short form that’s quick and easy to complete, and you can fill it in online. Visit the Soapbox Science 2015 Events page for more info. But why should you put your name down? We can give you 10 good reasons! 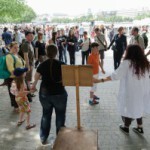 Unlike the majority of other science events and festivals, where the audience have made a conscious decision to go and interact with science and scientists, Soapbox Science really does take science to the streets. Or the park. Or the beach! The people you’ll talk to may not have intended to engage with science, but once they encounter our speakers they’re certainly drawn in. Our evaluation shows that over 80% found it enjoyable and 100% would come again! Families and school children make up a large percentage of the Soapbox Science audience, and we want to show them that science is fascinating, exciting and fun. Who better to inspire the next generation of scientists than women in science who are passionate about what they do, and can show the breadth of subjects, disciplines and applications there are out there! Science is still a male-dominated field, and although the visibility of women in science, technology, engineering, maths and medicine is growing, it’s still low. The public perception of scientists is still that of the male researcher, so by having an all-female group of speakers at Soapbox Science, we are beginning to challenge and change that view. This has important implications for encouraging more girls to take up STEMM subjects, so by taking part in Soapbox Science you are challenging stereotypes and acting as a role model for future women in STEMM. With the likes of Dame Athene Donald, Prof Lesley Yellowlees, Dr Maggie Aderin-Pocock and many others as Soapbox Science Alumni you’ll be in illustrious company! We aim to get a spread of career levels speaking across all our events, from PhD students to Professors, so you’ll also have the chance to network with other women in UK science, share thoughts and opinions, and seek advice. The Soapbox Science Team organise a series of training events across the UK that speakers are invited to join. Infinite Monkey Cage host Robin Ince will be on hand to help you hone your communication skills this year, along with some other secret ‘science celebrities’ – so watch this space! We also have highly experienced, dedicated Soapbox science communicator on the team who can help answer your questions, address your concerns and give you feedback on your ideas. From science communication training to deciding what props to use, the Soapbox Science team will be there to support you. There’s funding available to help cover reasonable prop production costs, and there’ll be a team of Soapbox Science volunteers on hand on the day to support each speaker, recruit an engaged audience, and ensure you have an enjoyable experience. With Soapbox Science, you’ll have the chance to share your research with hundreds of people at our events, but that’s not all. We showcase and profile each of our Soapbox Science speakers online in blog posts, interviews and videos, so your research will reach a significant audience. Our speaker’s have enjoyed publicity on the top profile science media, e.g. New Scientist, Nature and Science. It may sound intimidating, but we guarantee that speaking at Soapbox Science is an experience you’ll never forget. All our previous speakers have really enjoyed the chance to talk with the general public in such an informal, unusual way, and they’ve often gone on to participate in more science communication events. You don’t have to imagine what it’s like; watch our video to see Soapbox Science in action! Soapbox Science has received significant attention in the media, with articles and interviews featured online, in the printed press, broadcast media and within the scientific press. We’ve had blog posts by Soapbox Science speakers published in the mainstream national press, including The Guardian and The Independent. We work to highlight the profile and work of our speakers on the Soapbox Science website, and beyond. Our Soapbox Science alumni have benefitted personally and professionally from their experience. They’ve told us of many opportunities that have come as a result of their involvement, including receiving recognition within their University or organisation, invitations to join Athena SWAN committees, opportunities to become Departmental Outreach Leaders, and more! Have we convinced you? If you like to know more about Soapbox Science generally, have a look at our Soapbox Science 2015 article. Or if you are raring to go, sign up for one of our events below! 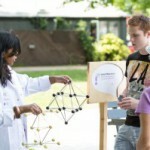 Why volunteer with Soapbox Science?